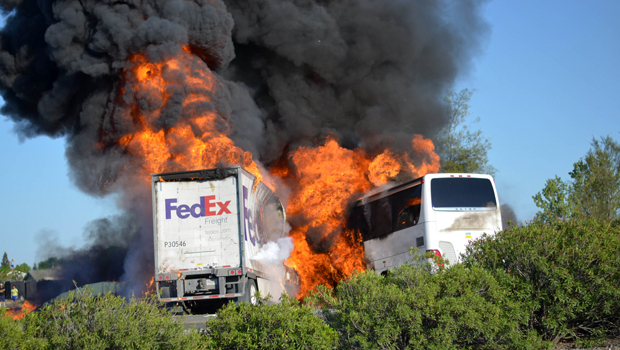 "We knew we were in major trouble"
ORLAND, Calif. -- A college visit by more than 40 high school students turned tragic when a FedEx tractor-trailer veered across a grassy highway median and slammed into their bus in a fiery wreck that left 10 people dead, authorities said. Someone kicked out a window on the bus, and many of those aboard squeezed through and ran for their lives to the other side of Interstate 5 before the vehicle exploded in flames. The 44 teenagers aboard, nearly half from the Los Angeles school district, were participating in a program that invites prospective low-income or first-generation college students to visit Humboldt State University in far Northern California. Steven Clavijo, a high school senior from Santa Clarita who planned to enroll at the school, was trying to catch a nap when he felt the vehicle begin to shake from left to right and then he heard a loud boom. "We knew we were in major trouble," he said. After he escaped, two more explosions soon followed. Clavijo and other survivors looked on, knowing others were still trapped in the inferno. Both drivers were killed, along with three adult chaperones and five teenage students, according to the California Highway Patrol. Jeremy Lockett pulled over on the freeway and photographed the wreck. "You could feel the heat from the flames like you were standing right next to it," Lockett told CBS News. "I've never seen anything like that." Towering flames devoured both vehicles just after the crash, and clouds of smoke billowed into the sky until firefighters doused the fire, leaving behind scorched black hulks of metal. Bodies were draped in blankets inside the burned-out bus. Three buses were traveling as a convoy and only one was involved in the crash, said Earl Perkins, assistant superintendent of operations for the Los Angeles schools district. Nineteen of the students on the bus were from the Los Angeles schools, Perkins said. The National Transportation Safety Board sent a team to investigate. "Every piece of paper associated with this will be looked at," said Eric M. Weiss, an NTSB spokesman. The crash happened a little after 5:30 p.m. on the interstate near Orland, a small city about 100 miles north of Sacramento. The bus was among three the university had chartered as part of its two-day Preview Plus program to bring prospective students from Southern California to tour the Arcata campus. The bus was owned by Silverado Stages, a tour bus company based in San Luis Obispo. The company said in a statement on its website Thursday night that it was assisting authorities in gathering information. "Our top priority is making sure that the injured are being cared for," the company said. Crisis counselors were also being made available at Los Angeles schools. Sabrina Garcia, a high school senior from Los Angeles, said the tour began Thursday, with buses taking students in Southern California on the ride to the campus for a three-day stay. She said she decided to postpone the tour because she had a school project to complete. "I was devastated when I heard about the crash, and relieved that I didn't attend," Garcia said. "I can't imagine how those kids feel. You think you're going somewhere safe with your school - and you end up in an accident." A CHP dispatcher says the bus and truck were on opposite sides of the freeway when the truck crossed the median and slammed into the bus, causing an explosion and fire. Investigators say the truck driver might have been trying to avoid a passenger car that was also involved in the crash, which shut down north and southbound traffic on the freeway. "There was a small white sedan in front of the truck," California Highway Patrol Officer Lacy Heitman said. "The FedEx vehicle did sideswipe the sedan before it crossed the median." No one in the car was injured. A first responder who helped set up a triage at the scene said 36 or 37 people were hurt, with injuries that included burns, broken legs and noses and head lacerations. "The victims were teenage kids. A lot of them were freaked out. They were shocked. They still couldn't grasp what happened," said Jason Wyman of the Orland Volunteer Fire Department. Eleven people were taken to Enloe Medical Center in Chico. Two of those patients were listed in critical condition Friday morning, the hospital said. At least seven people were hospitalized at other facilities. Two of them were in critical condition and five others in fair condition. A FedEx spokeswoman said the company was cooperating with authorities as they investigate.